The Perseid meteor shower, which occurs every year between mid-July and August end, will peak on 11, 12 and 13 August this year. The annual Perseid meteor shower, which is one of the brightest meteor showers of the year, will peak in the coming days. "It is usually the strongest one of the year, so you see more meteors per minute than other meteor showers," CBC quoted J Randy Attwood, executive director of the Royal Astronomical Society of Canada, as saying. "This is the one in the year where I would say that it would be worth someone's while to make an effort to see it." The August meteors are best watched in the Northern Hemisphere, where countries like India, the US and the UK are located. Much of southern parts of South America, southern Africa and Indonesia fall under low visibility region. Countries in the Southern Hemisphere like Australia, New Zealand, South Africa, Chile and Argentina have little or no visibility. The Perseid meteor shower, which occurs every year between mid-July and August end, will peak on 11, 12 and 13 August this year. A new moon on 14 August will provide perfect conditions for watching the meteor shower, as the sky will be darker than usual. If you are lucky enough, you can catch up to 50 meteors every hour during the peak days. 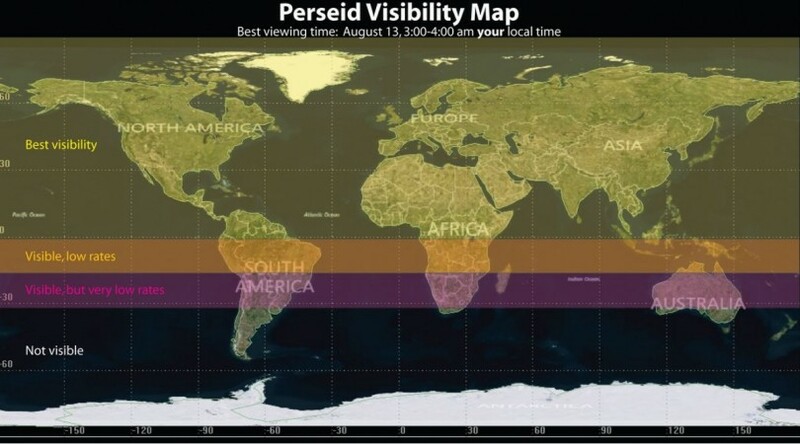 The best time to watch the Perseids is during the pre-dawn hours. Leave the concrete jungle and the city-lights behind and go to a rural area with open sky; it will increase your visibility. If you don't have a telescope or binocular, fret not; you can watch the meteor shower with naked eyes. It will take about 20 to 30 minutes to adjust your eyes to darkness. So keep your smartphones and other artificial light sources away to get maximum visibility. According to Nasa, one needs to lie down with feet pointing towards north-east to optimise the view. You can watch the Perseid meteor shower live on the website of Marshall Space Flight Center. The live covereage will be broadcast on Ustream from 9pm CDT on 12 August (7:30am IST on 13 August) to 1:30am CDT on 13 August (11:30am IST on 14 August). According to Nasa website, the event will also highlight the science behind the Perseids, as well as Nasa research related to meteors and comets. Nasa followers can tweet questions to @NASA_Marshall using the hashtag #askNASA. You can also post questions on the Marshall Facebook account, replying to the 9pm 12 August Perseid Q&A post.